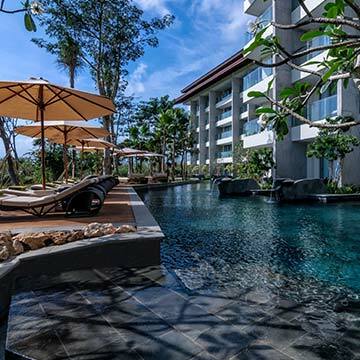 RIMBA Jimbaran Bali’s 8 hectares of gardens are located within the 90-hectare grounds of AYANA Resort and Spa Bali overlooking Jimbaran Bay and only 10 kilometers from Bali’s airport. The traditional fishing village just minutes away from this luxury resort in Jimbaran invites you to immerse yourself in a true Balinese experience. 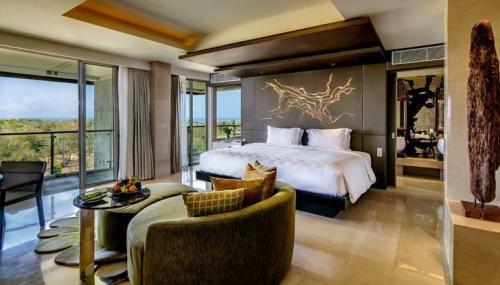 This luxurious 5-star hotel offers 282 stylish modern rooms matched by stunning sunset views and legendary service perfect for a rejuvenating couple’s getaway or family vacation. 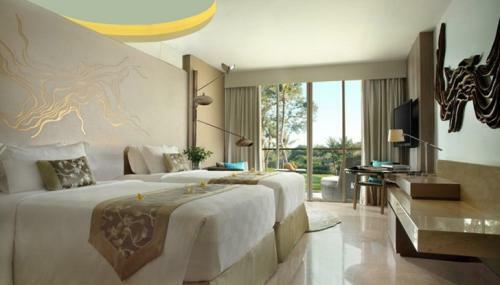 RIMBA’s luxurious accommodation includes Pool Access Rooms and spacious Suites with magnificent views of the ocean across tropical gardens and multi-layered swimming pools. For families, interconnecting rooms are available while recreation facilities abound with Kids Club, children’s pool with waterslide, and on-site babysitting. Guests enjoy the most extensive on-site facilities of any resort in Bali, with complimentary WiFi and convenient access by resort shuttle to all dining and recreation at both RIMBA and the ocean-front AYANA. A superb culinary journey awaits you with guests enjoying the choice of 15 restaurants and bars across RIMBA and AYANA, including priority access to the famous Rock Bar; the acclaimed Ah Yat Abalone Seafood Restaurant is renowned Asia-wide for its authentic Cantonese cuisine; To’Ge Restaurant serves international comfort food; and UNIQUE Rooftop Bar & Restaurant offers magnificent sunsets and stylish dining above the treetops. Guests of RIMBA also enjoy convenient access to exclusive private beach; 11 swimming pools across AYANA and RIMBA; world-class Spa with Aquatonic Seawater Therapy Pool and Spa on the Rocks treatment villas amidst the ocean; golf-putting and fitness center. Surrounded by a stunning lake, rice paddy and edible gardens; RIMBA's Kampoeng Bali is a stand alone restaurant with outdoor amphitheater that welcomes you into an authentic Balinese village experience. Enjoy an extensive Balinese buffet with live cooking stations as well as an exciting Kecak performance beneath the stars. Open Monday, Wednesday and Friday, this dynamic theatrical culinary program is designed to delight guests of all ages. 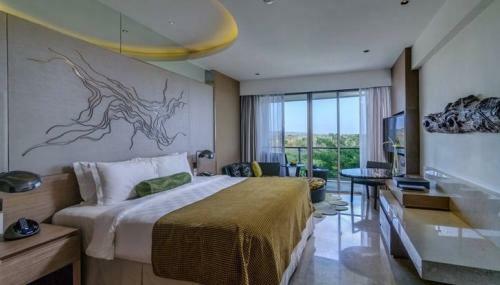 Each 38sqm Hillside Room at RIMBA Jimbaran Bali resort enjoys the best luxury accommodation and views of the surrounding forest from a private, furnished balcony in Bali. Décor is contemporary and vibrant, with an emphasis on natural materials and finishings. The day-bed doubles as an extra bed while the marble bathroom features deluxe shower and large soaking tub. Amenities include complimentary high-speed internet, 47-inch flat-screen HD-TV, writing table, aromatherapy set, mini-bar, and tea and coffee making facilities. 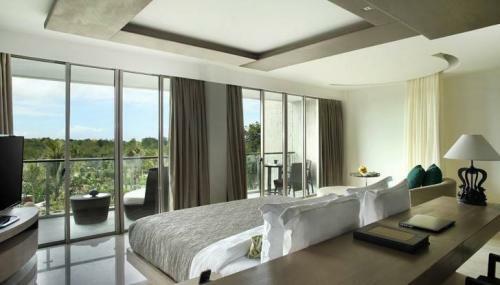 Each 38sqm Jimbaran Bay Room at our five-star Bali resort offers views of RIMBA Jimbaran Bali’s surrounding forest, tropical gardens and multi-tiered pools from a private, furnished balcony. Décor is contemporary and vibrant, with an emphasis on natural materials and finishings. The day-bed doubles as an extra bed while the marble bathroom features deluxe shower and large soaking tub. Amenities at our luxury hotel accommodation in Jimbaran Bali include complimentary high-speed internet, 47-inch flat-screen HD-TV, writing table, aromatherapy set, mini-bar, and tea and coffee making facilities. Each 38sqm Premium View Room at our five-star Bali resort enjoys an elevated location that affords magnificent views out to the Indian Ocean, across tropical gardens and swimming pools from a private, furnished balcony. Décor is contemporary and vibrant, with an emphasis on natural materials and finishings. The day-bed doubles as an extra bed while the marble bathroom features deluxe shower and large soaking tub. 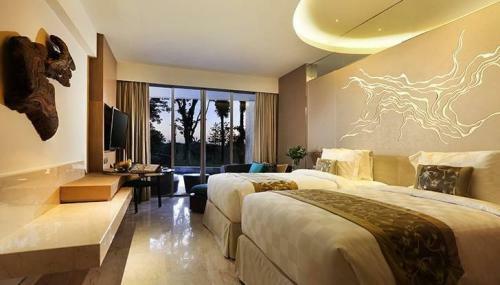 Amenities at our luxury hotel accommodation in Jimbaran Bali include complimentary high-speed internet, 47-inch flat-screen HD-TV, writing table, aromatherapy set, mini-bar, and tea and coffee making facilities. Each 38sqm Pool Access Room at RIMBA Jimbaran Bali resort offers direct access from the ground floor location to a semi-private swimming pool. This luxury accommodation in Bali is perfect for guests who intend to maximize use of the six swimming pools around our tranquil Jimbaran hotel. Décor is contemporary and vibrant, with an emphasis on natural materials and finishings. Each room has a private, furnished balcony, a day-bed that doubles as an extra bed, and marble bathroom with deluxe shower and large soaking tub. Amenities include complimentary high-speed internet, 47-inch flat-screen HD-TV, writing table, aromatherapy set, mini-bar, and tea and coffee making facilities. Each spacious 70sqm Jimbaran Bay Suite at RIMBA Jimbaran Bali resort offers views of the surrounding forest, tropical gardens and multi-tiered pools from a private, furnished balcony. This luxury accommodation in Bali is perfect for families and couples who seek maximum space and comfort, and elevated sunset views in Bali. Décor is contemporary and vibrant, with an emphasis on natural materials and finishings. A day-bed doubles as an extra bed while the marble bathroom features double vanities, separate shower and large soaking tub and luscious Aromatherapy Associates bath essentials. Amenities include complimentary high-speed internet, 47-inch flat-screen HD-TV, writing table, aromatherapy set, mini-bar, and tea and coffee making facilities. Each spacious 70sqm Premium View Suite at RIMBA Jimbaran Bali resort enjoys an elevated location that affords magnificent views out to the Indian Ocean, across tropical gardens and swimming pools from a private, furnished balcony. This luxury accommodation in Bali is perfect for families and couples who seek maximum space and comfort, and elevated sunset views in Bali. Décor is contemporary and vibrant, with an emphasis on natural materials and finishings. A day-bed doubles as an extra bed while the marble bathroom features double vanities, separate shower and large soaking tub and luscious Aromatherapy Associates bath essentials. Amenities include complimentary high-speed internet, 47-inch flat-screen HD-TV, writing table, aromatherapy set, mini-bar, and tea and coffee making facilities.